Directed by Wabash junior Reynaldo Pacheco, the show stars Wabash students Andrew Dits, Francis Raycroft, Joey Smith, and Tyler Bernet; Wabash staff member Steve Hester; and Crawfordsville’s Niki Hutson, Carol Homann, Nancy Rodenbeck, and Terry Swift. The comedy is the story of Lloyd Fellowes, the director of a theatre company producing a farcical play called Nothing On. Fellowes is desperately trying to get his production together, despite the best efforts of the cast, the crew, and Lady Luck. The audience follows production from final rehearsals, through opening night, and onto the tour. Romances and arguments break out. Quite often, what's happening on stage is nothing compared to what's happening backstage. 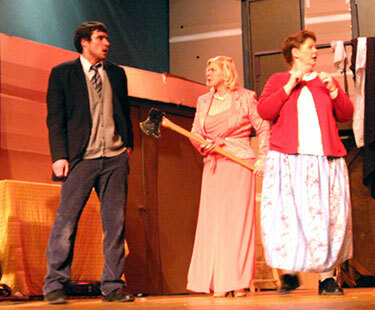 "Despite the humor in the play, Noises Off is one of the most demanding shows to make," Pacheco says. "The show went on because we put our hearts in it. I’m very thankful to all the cast members for making the impossible into a great play." Performances are scheduled March 17, 18, and 19 with an 8:00 p.m. curtain each night. Tickets are $8 and can be purchased at the Vanity Theater at 122 S. Washington Street or by calling 362-7077. Wabash students with a valid I.D. will be admitted for $5 Thursday only. In photo: Andrew Dits, Carol Homann and Nancy Rodenbeck.